I've seen them up close. They mostly look pretty scruffy. The ones I saw were in the Costa Rican rain forest, and though they were in the wild, they didn't really seem all that bothered by humans. Perhaps experience has taught them we're not so great at tree climbing. 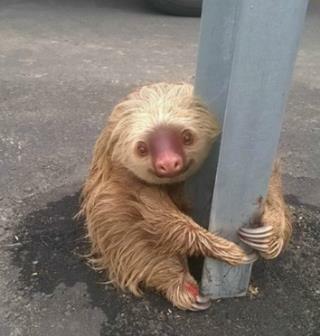 In another article I read about this incident it stated that a new road had just been opened up and this poor sloth was found clinging to a road sign. What happened was they destroyed more animal habitat with the road and the sloth was just confused. Those metal trees can be a beotch to climb!! Poor thing. Sweetest thing I've seen all week!